This is a wood plank 2ft square by half in thick painted black. 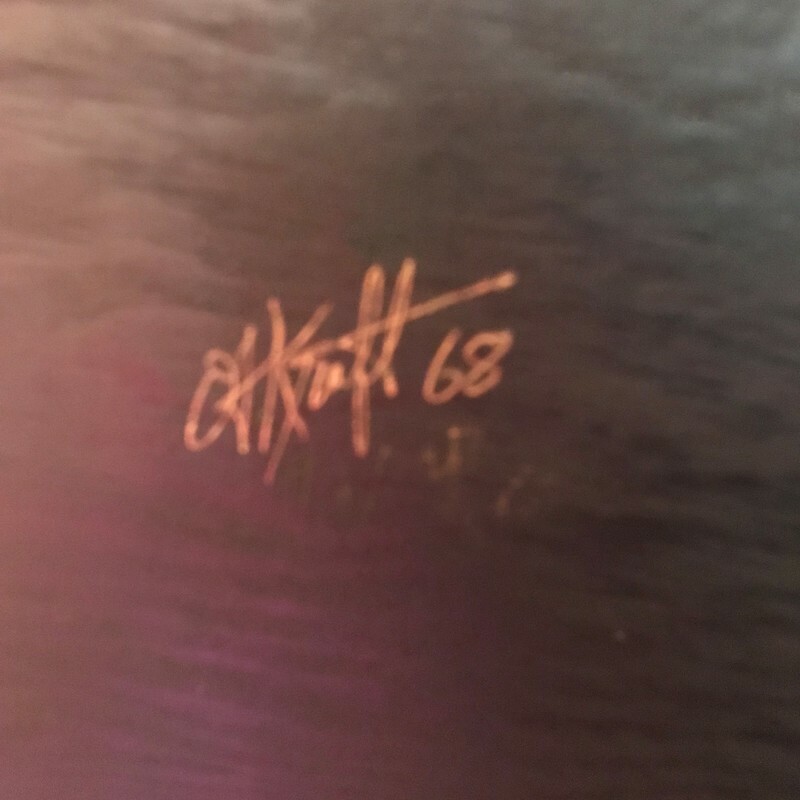 There is a unicorn made completely of carpenter nails, with an artist signature that looks like OJ Kraft, 68, but not 100% sure. It has been hanging on my grandparents wall since the 70's. no one in my family knows where its from. It was given to me when they passed in 2010. I don't know anything else about it. Thank you for contacting Mearto with your appraisal inquiry. So that I may best assist you, can you please upload a few better images of the signature and the reverse side of the artwork. Let me know if those pictures are better. Thank you for the additional information and your patience. Sadly regarding technical problems the new images were not displayed. I apologize for the delay. The presented object is an artwork made out of nails and wood with unknown measurements. It depicts a standing unicorn and ist signed O.J. Kraft and dated (19)68. Sadly no further information of the biography is mentioned for this artist in auction records or similar databases. An estimation would be between 75 to 200 USD. The artist name is Otto F Kraft from Hopkins, Minnesota. We found another one that a family member owns that is in the shape of a kimono dragon and sighned the back of it. That's interesting news. Can you upload the second artwork with the signature? Perhaps we can modify the estimate. See if that gives you some more info. We cannot find any of his art sold but found articles of the artist. Thank you for the new images and interesting facts. I researched in the databases and auction lists but Otto F Kraft is not mentioned. Nevertheless, because he is a locally known artist it is quite possible that artwork by Otto Kraft could reach prices up to 500 USD when you find a collector.